The business which later became known as ‘James Moody and Sons’ was established in 1800 according to an 1895 billhead. I think originally it may have been simply called ‘Moody’, which is what appears on the sign over the shop in an 1866 billhead. It was probably set up by three brothers: John Moody (senior) born 1782, William Moody (senior) born 1780 and James Moody (senior) born 1785. The 1823 and 1839 trade directories list John and James Moody (senior) as Cabinet Makers and upholsterers in Market Place, Basingstoke, just a few meters away from 17 London Street where the business was later run from. 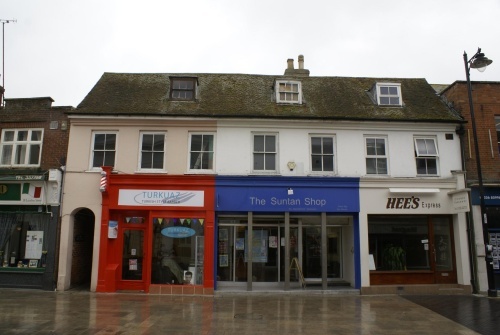 The 1841 census lists John Moody (senior) as a Cabinet Maker in Basingstoke, and William Moody (senior) as a Cabinet Maker on Winchester Road in Basingstoke, which is to the west of Market Place, they had perhaps expanded the business to two premises. 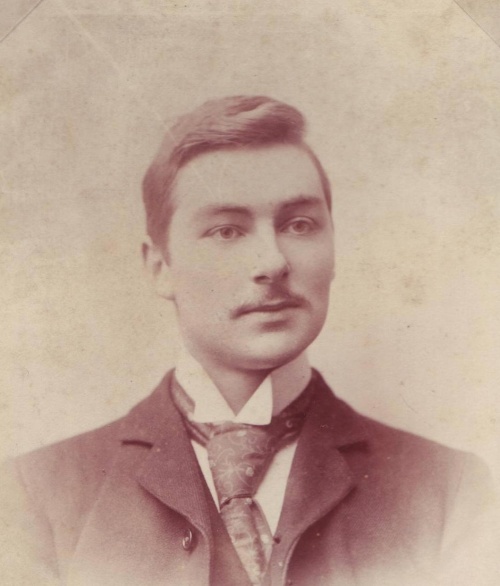 According to Moody family history, it was William Moody (senior) who started the furnishing business in Basingstoke. John Moody (senior) died on 8th January 1842 in Basingstoke after a short illness, and William Moody (senior) died on 6th August 1855 in Basingstoke. James Moody (junior) born 30th January 1826 in Basingstoke, and Charles Moody born in 1831 in Basingstoke. In 1841 James (junior) was an apprentice Cabinet Maker, living with his parents at the Anchor Inn. He married Amelia Hedges on 30th May 1850 and by 1851 he was an upholsterer living on London Street, employing 4 men. In 1861 he was still an upholsterer living on London Street, but by 1871 he had moved out to Winchester Road. He had moved to 17 London Street by 1881, where he is registered on the census as an upholsterer. 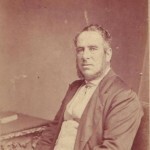 Charles Moody does not have a profession listed in the 1851 – 1871 censuses, but in 1851 he is living with his brother James. The Attwood diary states that Charles Moody of Alton married to Maria Brand about March 1851, but by 1855 Chalres Moody the Cabinet Maker had his goods sold for debt at Newbury about November 30th. By 1881 he was a house decorator, living in London. It is possible that he undertook an apprenticeship with his father, or one of his uncles, and then decided to try his luck in the house decorating business in London. James Moody (senior) died on 13th April 1844, the Attwood diary states that he destroyed himself by strangulation aged 59. 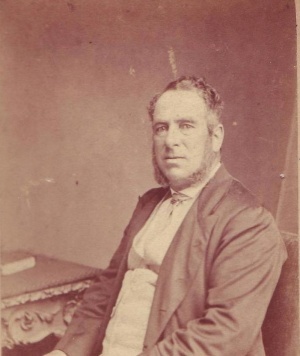 James Moody (Junior) also worked along side two of his cousins, sons of his uncle William Moody: William Moody (junior) born in 1811 in Basingstoke, and John Moody (junior) born in 1819 in Basingstoke. 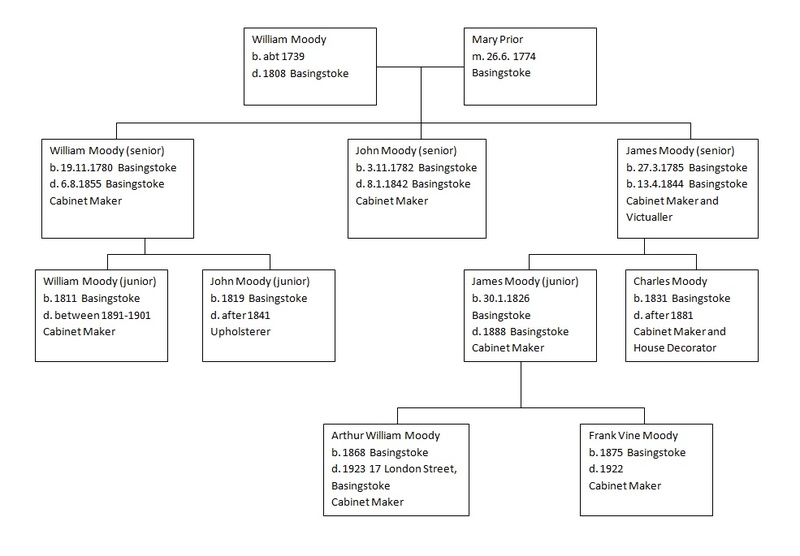 William Moody (junior) is registered as a Cabinet Maker by 1861, and in 1871 is living at 16 Church Street, Basingstoke, near to where ‘The Little Dust Pan’ was later, at number 11. 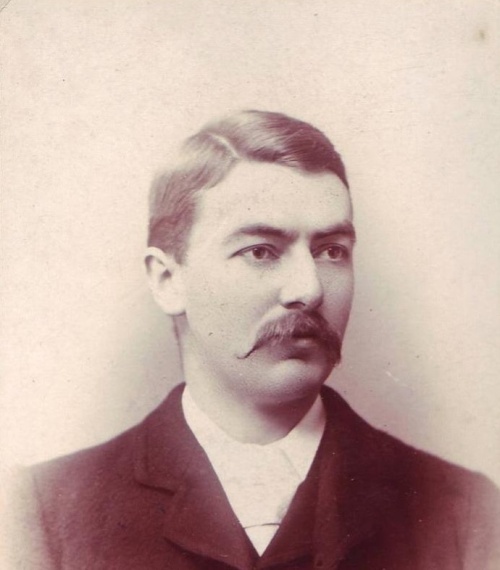 At this time his son in law Alfred Ryden, a Cabinet Maker, is also living there. William appears to have remained at 16 Church Street until he died in the 1890′s. John Moody (junior) is registered in the 1841 census as an upholsterer in Basingstoke. 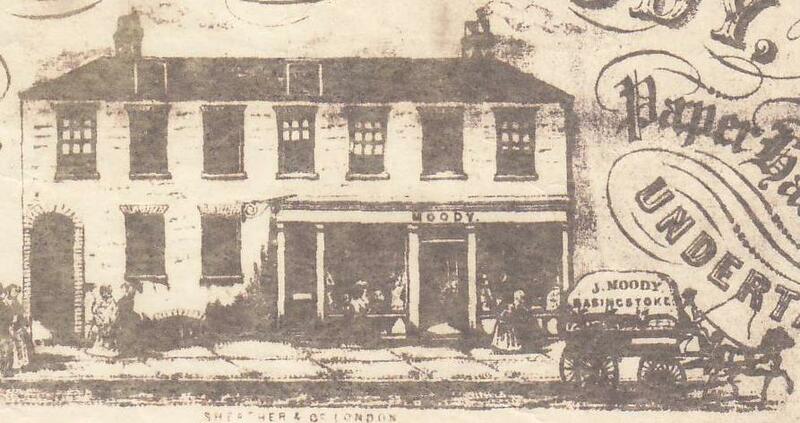 In 1866 it appears that James Moody (junior) was running the business, possibly employing his brother Charles Moody, and his cousin William Moody (junior). At this time, the business boasted to be a Cabinet Maker, Upholsterer, Paper Hanger and Undertaker. 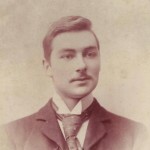 James Moody (junior) married Elizabeth Paice on 1st February 1866. 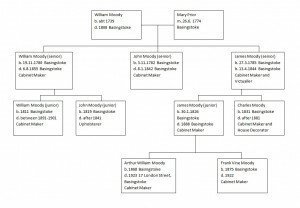 They had six children, including two sons, Arthur William Moody born in 1868 in Basingstoke and Frank Vine Moody born in 1875 in Basingstoke, both of whom worked for the family business. As well as the main premises in London Street, which included the family residence, there was a smaller shop at 11 Church Street, “The Little Dust Pan”. Moody’s also owned, or perhaps rented, a furniture repository in an area then known as the Steam Dell, which lay between the railway goods yard and the Reading Road. A Wallis and Steevens steam wagon with a James Moody trailer, laden with furniture and carpets, made regular trips to Hackwood House, when Lord Curzon was living there. James Moody (junior) died on 20th October 1888 at London Street Basingstoke aged 63 years. 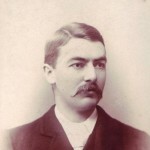 His son Arthur took over the running of the business, and he was later joined by Frank. An 1895 billhead, headed “J Moody”, describes the business as: the “Complete House Furnisher” with interests in “Removals and Warehousing”. The billhead also proclaims: “Funerals Furnished” and “House Agency and Valuations. Antiques. Workrooms & Workshops on the premises”. The family business of James Moody and Sons went into liquidation in 1936.